If you know, or are, a tabletop gamer, you know that there is something . . . odd, about their relationship with dice. For some of us, its simple. We get mad when we roll poorly and excited when we roll well. For others, we spurn and embrace the little polyhedrons as the winds favor certain combinations. For some of us though, an animistic view becomes prevalent and we find ourselves test rolling dice, feeling bonds with dice, selecting them from a balance of aesthetic, balance, "rolls" and even materials (ty to JBJ for my pewter dice set, they have served me well!). Although I have recently discovered THIS GUY (He seems kind of odd at first, and yes, he is VERY passionate about the dice, I believe it and recommend them to any who are even slightly interested) thanks to Gilliam, and fully intend to purchase some dice and use them (Gilly has a set already and they are very crisp and clean, they feel very exact) I still like a little "mojo" to dice and think it adds to the overall experience. I've heard rumors that the longer you play, the better you roll, but I find this to be invalid. 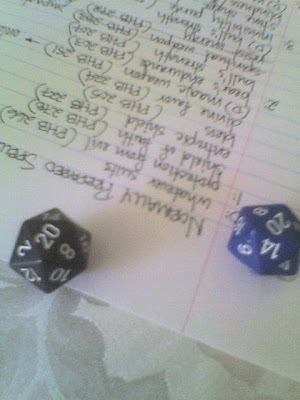 Some members of my group have used dice rolling software for ease and simplicity, and to further my geek cred, we can tabletop on the fly by keeping our character sheets on digital copy. How many times have you seen a group of geeks playing D&D at a park WITHOUT pencils or dice? Done it! BUT! I shy away from it. Much like music and books for me, having a digital is nice, but having a tactile object, something that cant run out of power, is always preferable to me. This is just my opinion, but I think there is more to it than just convenience and economy. 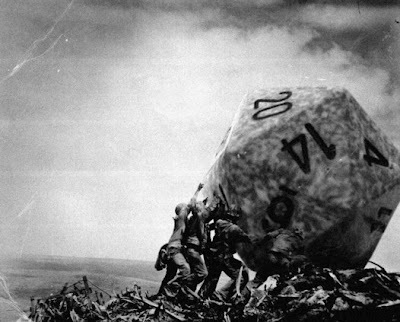 Whether you're feeling out the "right" dice at the local comic shop or hand painting numbers onto your new razor-sharp-verticesed d4's, keep rollin' kids. Here's to those sweet rolls that make a great story years later, that only other weirdos like you can understand. Those great opening lines "this one time in-game . . ."